Staying protected when working in hazardous atmospheric conditions has never been easier thanks to a new range of fixed system gas detectors from Sperian Protection, a leader in personal protective equipment. A single channel fixed placement multi-gas detection system, Biosystems NXP is engineered to provide 24/7 monitoring of dangerous gas and atmospheric conditions , the NXP can be fitted with sensor options including O2, CO, H2S, SO2, NH3 as well as CO-H, and LEL. Cost effective and ultra easy to install, the Biosystems NXP gas detectors come with a full range of installation options, including stand alone, integrated into control systems or as a part of a larger gas detection network. The Biosystems NXP gas detectors offer great standard features, which ensure their safety. 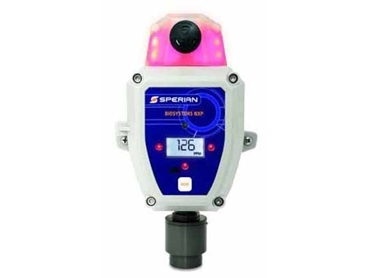 Built tough in IP66 housing to protect the unit in harsh conditions or during wash downs, the Biosystems NXP gas detectors feature integrated twin colour high-intensity strobes and a 105 db audio alarm, an on-board event logger, and real time LCD readout as standard. With a wide range of customised options available, including a choice of alarm levels, relay modes and strobes, as well as alarm enable / disable, the Biosystems NXP can be customised to suit any work environment.